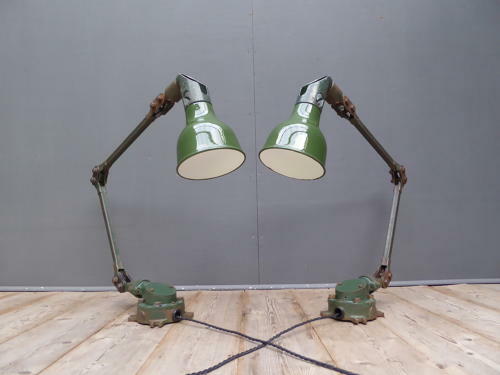 A stunning pair of vintage industrial Mek Elek machinist lamps. A fantastic pair of twin arm Mek Elek lamps with amazing build quality and glossy green & white enamel shades which contrast beautifuilly with their worn paintwork. This particular pair of lamps were once fitted to the inside of a ship and the heavy duty bases are unusually cast in iron & also brass. Wonderful industrial lamps which look fantastic wall mounted & make great bedsides. Wear commensurate with age, overall very good showing pleasing signs of their industrial past. Measurement given(115cm) is a flat out measurement & overall height or reach depends on position. Electrical items should be checked and / or installed by a qualified electrician prior to use.